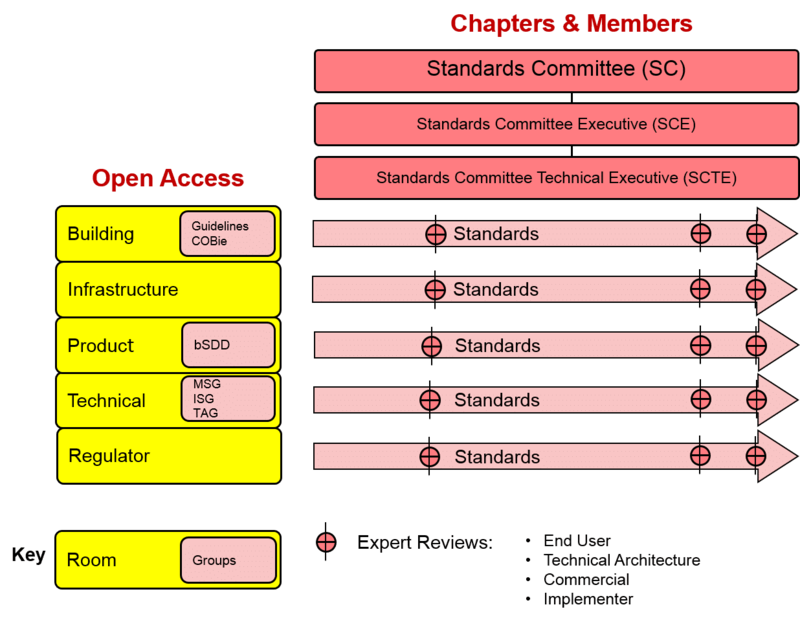 The Standards Committee is the senior governance body overseeing the standards process. It comprises representatives from members and chapters with voting privileges based on their membership status. The Standards Committee Executive has executive responsibility for establishing and managing the standards program on a day to day basis. liaison with the Compliance Program on certification and capability accreditation. Rooms are open groups of people and organizations that want to improve construction and operation of the built environment by using advanced information technology in the form of openly and freely flowing structured information throughout the lifecycle. Rooms focus on a specific domain or context. Rooms are open to all and may comprise both users and technical people. Rooms form and support working groups and projects depending on the nature and scale of the issues to be addressed. Groups are spawned by one or several rooms and are formed to address a specific issue or requirement. There are two types of groups; Support Groups for coordination, system wide support or expert know how and advice, and Working Groups for delivery of solutions to a complex problem or specific projects. Projects are the primary mechanism by which standards work is to be formally executed. Projects are expected to operate in a formal way in accordance with the Standards Process requirements.